Leisure activities can be all consuming. A few years ago, a dear friend introduced me to something that was relatively new, called Pinterest. For those who have no idea of what Pinterest is … well, it is an online collection of every sort of magazine you could ever imagine! It features recipes, DIY projects, gardening, fashion, history, science, and pretty much anything else you could ever imagine needing or wanting. Once you sign up, on Pinterest, you can start ‘pinning’. 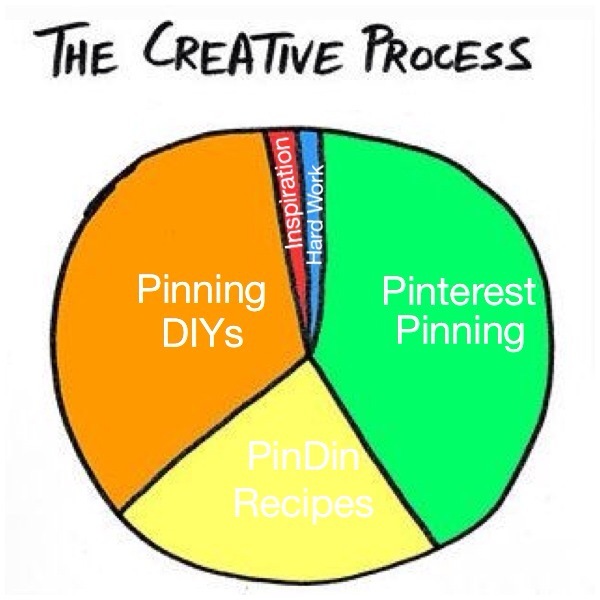 To pin basically means to save, on the Pinterest site, things that appeal to you. Once you begin to pin, you will then be able to create ‘boards’, which are sort of like virtual file folders. You also have the opportunity to ‘invite’ friends to join, and then to ‘follow’ or be followed by others. In no time at all (and I mean, no time at all), I had collected/pinned over three thousand pins! That was way back! Now I have eighteen different recipe boards, and thirteen DIY boards alone! But, I have also deleted many pins, opting, instead, for things that I love (not like), and things that I will follow through with and do, fix or create something from them (aka. they are practical). If I have tried a recipe, and we love it (not just like it, cause, no one has time for that), I add a note, followed by ‘CW’ … if we don’t like it, it simply disappears. I challenge you ‘pinners’ out there to do a bit of editing, and to spend more time utilizing this resource than simply using it as a time-waster. Follow me, if you like. You can find me as Carole Smith-Wheaton.